The flood-ravaged city was on Saturday struggling to return to normalcy with partial restoration of telecommunication and train services, besides many roads also becoming fairly motorable even as waterlogging woes continued in several areas. 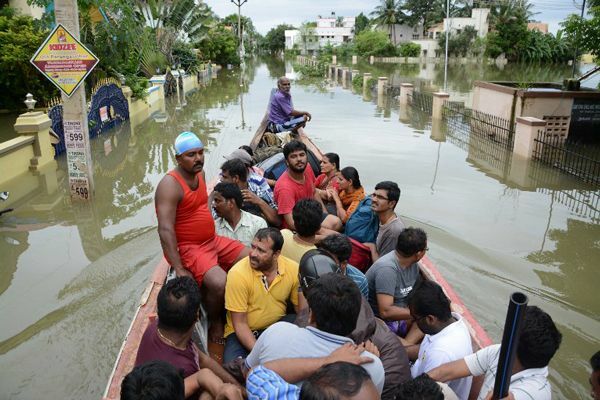 Torrential rains have left at leasts 245 people dead since October 1, according to the Tamil Nadu government. The situation took a turn for the worse on Tuesday with large areas of the city flooded. The deluge destroyed crucial road and rail links, shutdown the airport, snapped power and telecom lines and left lakhs of people stranded. Waterlogging continued in many parts such as Kotturpuram, suburban Mudichur and Pallikkaranai even as hapless residents who had taken refuge on higher floors of buildings were seen pleading for essentials like milk and water which remain in short supply. There were serpentine queues outside the few ATMs and petrol stations that were operating. Tamil Nadu government has said that the fuel situation will ease in the next couple of days. Banks in the state will remain open tomorrow, though it is a Sunday. In its bid to link the southern parts of Chennai with the main city, Southern Railway announced operating services on the busy Egmore-Tamabaram stretch bringing much needed relief to the residents. Although services are generally operated between Chennai beach and Tamabaram, trains are now being operated only between Egmore and Tamabaram and that too only on the main line, southern railway officials said. In many areas, including Tamabaram, telephone landline services were being restored even as mobile services also picked up pace. Rains lashed a few parts of the city overnight but let up in the morning though the sky remained overcast. Supply of milk continued to remain erratic although state-run Aavin had taken steps to ensure adequate supply of the essential commodity. Vegetables continued to remain costly. READ NEXT >> Arvind Kejriwal has a question for PM Modi: How does he manage with his meagre salary?